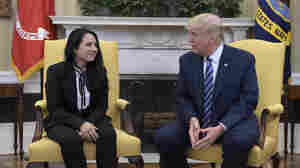 Egyptian-American Aid Worker, Released From Cairo Jail, Returns To U.S.
April 21, 2017  Aya Hijazi and her Egyptian husband were accused of child abuse, but human rights groups called the charges specious and prosecutors offered no proof. The couple were jailed for nearly three years. April 16, 2017  Egyptian-American aid worker Aya Hijazi was acquitted Sunday after being held for nearly three years without a verdict in Cairo. Human Rights Watch has called her case a "travesty of justice." May 16, 2015  The former president who was ousted in 2013 had already been sentenced to 20 years in prison on other charges. The country's highest religious authority will still review the penalty. 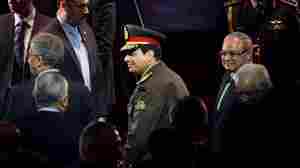 May 29, 2014  Abdel-Fattah el-Sisi "won by more than a landslide, taking at least 93 percent of the vote," reports NPR's Leila Fadel from Cairo. March 30, 2014  Egypt will hold its presidential election on May 26 and 27, a government election commission announced Sunday. Many expect the country's former military chief to win the office. March 26, 2014  Field Marshal Abdel-Fattah el-Sissi says that he's resigned his military post and will run for president in July elections. February 24, 2014  All Cabinet ministers are stepping down, the nation's prime minister announced Monday. Among them: Defense Minister Abdel-Fattah el-Sissi, who will now be free to seek the presidency. January 27, 2014  Shortly after Abdel-Fattah el-Sissi was made a field marshal, the military said he should "answer the call of the people" and run for president. Elections are set for April. 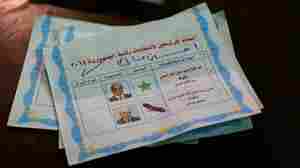 January 16, 2014  Unofficial results say more than 95 percent of voters approved the document. 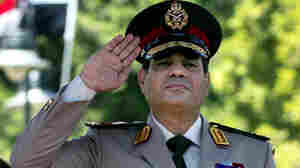 The results are seen as a boost to the military government and Army chief Gen. Abdel-Fattah el-Sissi, who is widely expected to seek Egypt's presidency. The Muslim Brotherhood boycotted this week's vote.